This manuscript was written by a Continental scribe, probably in France. A flyleaf inscription, probably written in the 16th century but imitating 11th-century English script, is perhaps a copy of a now-lost inscription, that states that the book was given by King Aethelstan (reigned 927-939) to St Augustine's abbey, Canterbury. If the inscription is to be believed, this manuscript represents an example of foreign book-decoration that native artists could have seen and assimilated into their own work. 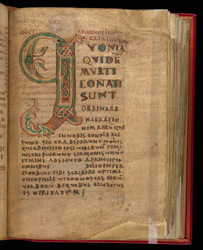 Despite the fact that it is written on a comparatively poor sheet of parchment, this page was designed from the start to visually arresting: in addition to the large initial 'Q' and the opening words of the text written in large capital letters (as at the start of other Gospels) all the text on this page has here been written in capitals, highlighted with red, green, and yellow.